The marquee of the City National Civic in San Jose read Ringo Starr and his All-Starr Band….rightfully so. Being a member of arguably the most important band in music history pretty much guarantees top billing. However, it would have been more accurate if the name were inverted for this evening’s performance, a stew of very different musical flavors, only some of which included ingredients from Ringo Starr. That’s not meant to harsh the 78 year-old former Beatles drummer, but while he was the drawing card of the evening, he certainly was not doing much in the way of heavy lifting. Starr (who actually looks great for his age) did himself a favor in collecting the musicians he had on hand for the 13th incarnation of his All-Starr band. A cadre of outstanding musicians from some of the most popular bands of the last forty years allowed Ringo to pick and choose his spots of when he wanted the spotlight as opposed to being the center of attention for the entire night. That equated to his partaking in about 60% of the set in one way or another, with his main role more akin to being the big-name host of a variety show, occasionally yielding to celebrity guests. Of the totality of time he was onstage, Ringo alternated between being emcee/front man, singer, and co-drummer (when drumming he was doing so next to the absolutely amazing Gregg Bissonette…not as a solo drummer). 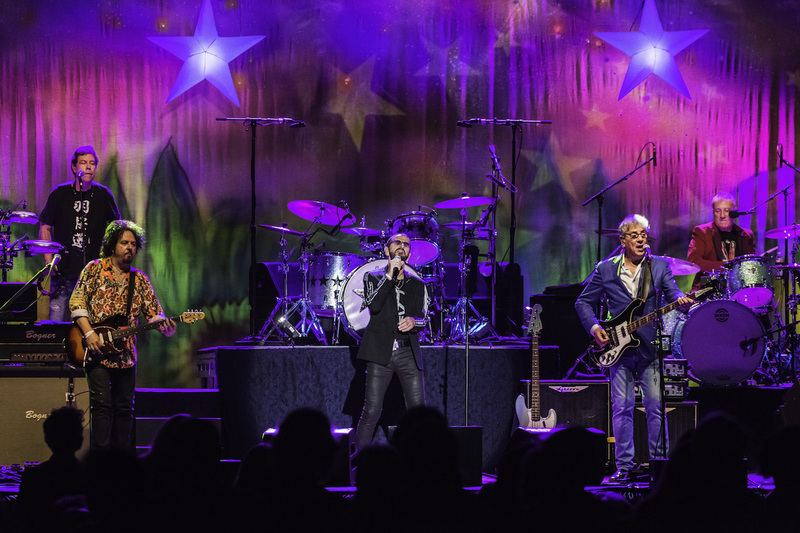 Though the vast majority of the audience (generally in their 50’s and above…some with grandkids) was there to see the ex-Beatle, the real goodness of the evening came from the performance of Ringo’s All-Starr Band. Backing Starr was a stellar sextet of musicians consisting of the very under-appreciated keyboardist/vocalist Gregg Rollie (Santana & Journey), guitarist Steve Lukather (Toto) , the aforementioned Bissonette (drums), Colin Hay (Men at Work) on guitars/vox , Graham Gouldman (10cc) on bass/vox, and possibly the most valuable performer of the evening, Warren Ham, who played all the horns and utility instruments needed depending on what song was being played. From the get go, that aura of a variety show came through, as Starr goofily bounded onstage flashing peace signs and generally cheesing it up for fans as the All-Starrs kicked off with a cover of the rock ‘n roll classic ‘Matchbox’ (Carl Perkins). 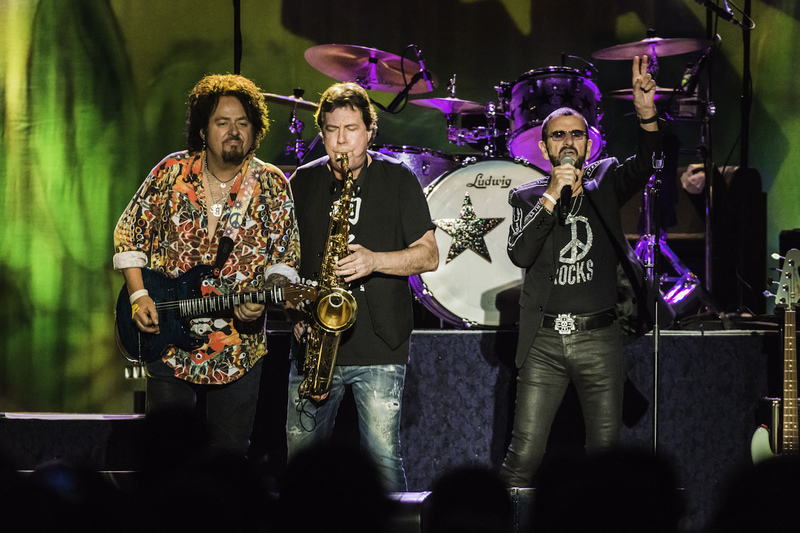 The energy in the place was high, with fans out of their seats and cheering the jaw-dropping musical chops of Rollie and Lukather trading leads. Starr, still front and center, then turned to his catalog for ‘It Don’t Come Easy,’ his bouncy 1973 solo single co-written with ex-Beatles mate George Harrison, and ‘What Goes On’ (Rubber Soul – 1965), a classic Beatles ditty that sports Ringo’s name in the writing credits. This is what it seemed most folks were expecting, lots of Ringo performing his own songs but more specifically laying down the treasures from the Beatles’ archive. Strangely enough it was at this point that Ringo chose to take an abrupt turn. Though the audience was fully in the groove of Beatles nostalgia, he chose to fade to the background, climbing behind his drum kit to play tandem drums with Bissonette. If you watch Gregg Bissonette play, it is apparent in the first 3 seconds that he does not need any drum support….all of his limbs can fluidly synchronize in odd time to sound as if he is a drum line all by himself. What Ringo offered on the drums was basically serving as a metronome as he played only the very basic root of the beat. It was completely unnecessary, but did keep Ringo onstage for a bit, though he would eventually disappear altogether leaving the All-Starrs to play a few songs by themselves. It was when Ringo handed off the keys to the set that it actually took off, allowing the players to stretch out on bits and pieces from their careers. Rollie took vocal lead on an explosive version of ‘Evil Ways’ (from his Santana days) and also put down some on fire Hammond organ, while Lukather reminded everyone that he is a guitar wizard, burning up his fretboard while performing ‘Rosanna’ (Toto). Though the showcase of spectacular musicianship by the All-Stars was on display the entire show, it also created the weird side effect of making the flow of the evening a bit uneven. Once the audience would get into the zone of the rock of Santana and Toto, the band would transition to the softer (and to this crowd) more obscure 10cc and Men at Work tunes, which caused the energy in the room to ebb and flow. Steering back to Ringo/Beatles tunes from the variety of rock rolled out by the All-Starrs also proved to be a bit of a challenge. The classic songs (like ‘Yellow Submarine’ and ‘I Wanna Be Your Man’) were there and were immediately recognizable, but with Ringo out front again awkwardly bouncing from side to side as he sang in a slightly monotone way, it had the feel of a Beatles cover band….and lacked the magic that I’m sure the packed house hoped for. The evening closer, ‘With a Little Help From My Friends’ (1967 Beatles –Sgt Peppers) was apropos on a number of levels and ended the night with a brightness that was befitting of what the Beatles represent. It was a sparkling performance that was easily Ringo’s best of the evening and left a good overall impression of Starr as the star of the show, though it was his ‘friends’ (the All-Starrs) that helped him get by. The way they mashed it into a medley with John Lennon’s ‘Give Peace a Chance’ to complete the show was a poignant commentary to our current political climate….speaking to us through the timeless music of the fab four. Find out more on Ringo Starr’s website.